Live performance with digital video and sound. Melodramatic and deliberately film noir-ish, this performance was premiered at ‘Projet/Projo’, a Studio 303 exhibition/event (production in collaboration with Mai), Montreal, Canada. Much of my work looks at voice, silence and power, through the use of displaced and disordered identities or personae. 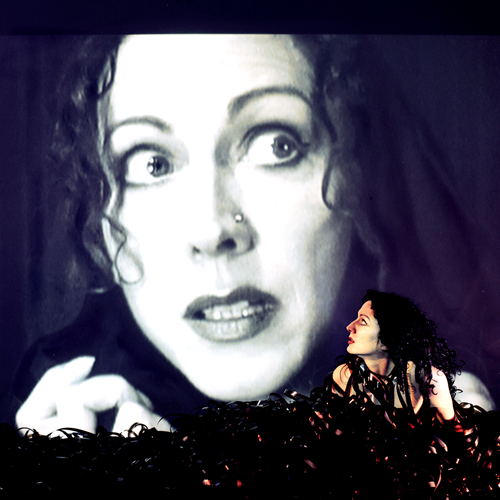 In this performance, the protagonist (the live performer) is inside her own melodrama talking with fractured versions of her identity, inside her own head, inside her imagination and visualised like an old film. The women, live and recorded, appear to speak but the words have been taken from old movies and reworked into the soundtrack. They are lip-syncing – these are not their own voices yet they seem to be speaking. The voices speak of discomfort, suicide and madness. As the protagonist struggles to keep hold of herself, of her voice, her composure, she is always taken over by a voice that constantly undermines her. Finally the malevolent images fade and she retreats to her original position, pulling the film back over her body until she is hidden once more by the celluloid. Nailed to the wall by my hair (pulled back in a long plait), the piece consists of a series of arrested poses, each held for about 10 minutes, for a duration of up to 2 hours. The work tests both the endurance of the artist’s body and the extent to which a moment of performance can be stretched. My intention in this performance is to place assumptions about the female body under scrutiny and pose awkward questions: can we understand the female body in terms of strength & endurance, in terms of dynamism and even aggression? Does the ironic adoption of feminine poses (i.e. passive & available) trouble widely held ideas about how a woman should appear in public? Deliberate display of the female body is often dismissed as narcissistic – can my avowed narcissism be used creatively? Live performance with sound and video projection. The auditorium is dark – absolute black. A loud sound and then the film flickers up to reveal a lone woman in the light. She is standing stock still, aggressively, clenching her fists. The soundtrack begins. It consists of samples of dialogue, cut from various movies. The performer lip-syncs to the stream of voices, some male, some female, mostly disagreeing with each other. It is as if she cannot help herself – she opens her mouth and the words of others pour out. Trapped by the light, caught up in the voices, she has become a conduit for dismembered and disconnected speech. This is a dark performance, verging on hysterical, in which she plays out her internal melodrama publicly. A soundtrack plays on hidden speakers. The first section is a rhythmic composition of clicks and grinding sounds, followed by collaged sounds, voices, whispers and music. A Super 8 projector stands approximately 8-10 feet in front of figure. Space: Central area of large cloisters (the building was an old monastery and is now functioning as a cultural centre). Overlooked by two storeys of windows and balconies. People watch from balconies and walkway surrounding cloisters. On one balcony, a projector is positioned – the image hits the ground as a skewed rectangle. Small candles burn in the corners of the space. Performance: A sole female figure occupies the central area of a Cloister space. She marks out 12 areas by placing various objects in the on the ground. Bound tightly at the waist with black ribbon, she is attached to twelve pillars. She sways gently and sings quietly as a video projection plays over her, from above. Surrounding her is evidence of the process and actions that brought her to this point. Place: The Jacobean Undercroft, Greenwich Palace, London. 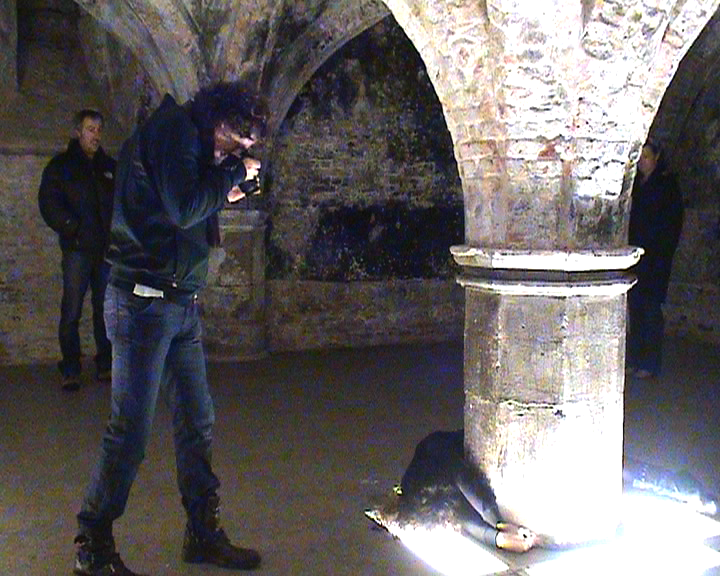 A soundscape and a durational performance, are the main components of this work, which has been specially devised for the Jacobean Undercroft, The work is a response to the function and architecture of this ancient underground space, and is concerned with retrieval and reconstruction through action. Viewers could come and go as they pleased. The figure is female, dressed in black, long sleeved, high necked top and very full skirt (to just above ankles). No shoes. Her waist is pulled in very tight by a belt. She is suspended by her hair, via a noose attached to a rope and pulley. Just the tips of her toes touch the floor. She is neither on the floor, nor in the air. At all times her hands are open, her eyes do not blink. Seemingly destined to repeat herself over and over, she is exposing the voices in her head, exposing a litany of descriptions that she has taken on for herself, and daring the viewer to watch her and embrace her discomfort. Using video projection and lip sync, the artist dances with her video double. A live figure appears in the centre of the performance space. Projected over her body is an image of her virtual self. The soundtrack has a swaying, hypnotic rhythm and both figures speak, addressing each other and the audience. In the soundtrack, there is a deliberate play with registers of both sound and presence. The electronic voice, the recorded human voice and the live human voice are combined yet obviously existing on separate levels. The live persona intertwines with the virtual one but both insist on being simultaneously present and multiple. Both issue from and return to a single body. Absolute darkness. Centre stage a blue light (from overhead) fades up making a pool of light. A girl sits, poised, composed, still. She is on small white stool and wears a thin dress, high heels and stockings. Her hair is black, cut in a short bob. Facing stage left. Soundtrack begins – a staggered monolgue against a repeating tone. The voice is female, deprecating & mean. The subject matter of the monologue is dark – the voice talks of death, of loss and breakdown. It proposes that the audience see her as being trapped in a kind of limbo, perhaps in the moments between the end of her life and death itself – not so much ‘going into the light’ but rather suspended within the full glare of it. 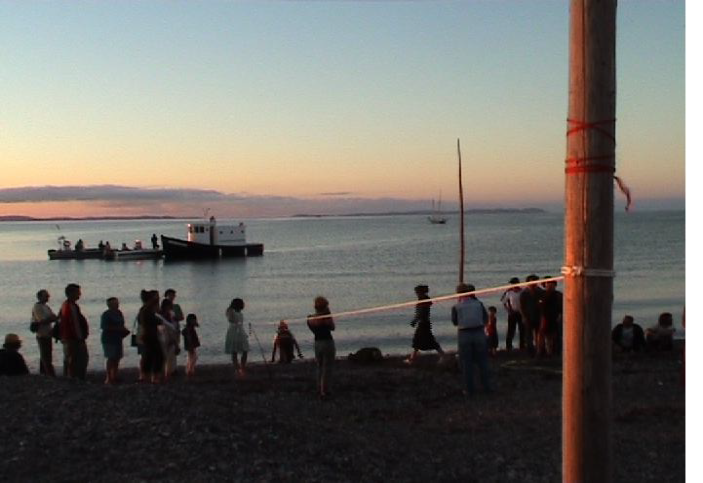 This performance was developed in response to the space and context of the yearly performance event, organized by Paul Gregoire. The site is a beach on the Isles de Madeleine, just off the coast of Quebec, Canada. It is a tiny and very old fishing community and the beaches are lined with small wooden huts. Not dwellings to live in, these constructions were occupied by the wives of the fishermen who would prepare the fish that the men caught. The experiences of these women would have revolved around hard work and waiting for the men to return and of course, there were times when the boats would be lost at sea. The performance was devised here with this history in mind and also in conjunction with the other artists’ actions in the event. In some ways the piece is about being literally tied to the land whilst yearning for that which is lost at sea but it is also about the strength and endurance of the female body and about how the work of women is interactive and relational.